Hassle free. Phenomenal. Easy going and attentive. I can not say enough abt nor can I thank this man enough for his services at our wedding. He was one of the most stress free and willing to help vendors that I have ever had the pleasure of working with. If you want your wedding to be Blessed DJ Lee Mastermind is your man. Do not do yourself a disservice by looking any further. Lee was recommended to us by another professional we had hired for our event. That was the first sign he would be great. Lee was professional, responsive and flexible in planning the event. And he was great at reading the crowd and playing just the right music to get and keep everyone on the dance floor. I highly recommend. DJ LEE was fantastic. He arrived early and set up and made sure everything was ready to go without needing any direction from us. The ceremony music was perfect and the reception was a WOW! He played a great mix that kept everybody dancing, especially the bride and groom with music from multiple genres and eras. He was polite, professional and charming. Please don't hesitate to hire Lee, he won't disappoint. A++++++ Great value and service. Honestly the best. So easy and fun to work with, kept the party going and was a great MC. Would recommend to anyone looking for a great and professional DJ!!! DJ Lee was great!! He engaged the crowd with his selection and was very flexible with requests. He was our DJ for our wedding recently and he kept me on my feet the entire night! He was also so professional which is always key when trusting a DJ with an important event. All of our guests and other vendors loved him. Highly recommend him. DJ Lee is just awesome! We were at a baby shower that he was dj'ing. We loved the music selection. We were in the middle of intervening DJ's for our wedding. He was our top pick hands down. Our wedding was 6/16/2018. We didn't have a wedding planner. DJ Lee coordinated the day for us from the beginning of the ceremony to the end of the reception. He was awesome the entire day. Everyone danced all night until the place closed. If you have an event coming up and need a DJ, this is the one. I strongly recommend DJ Lee 100%. We got married June 9, 2018 and decided to book Dj Lee back in October. We went to a family wedding he also dj for and loved his skills. He was always there to answer any questions I had and very helpful at times when we struggled with certain music selections. I was nervous because I'm cape Verdean and my husband is guyanese wasnt sure he would know what to play for my husband side but after talking to him and giving him a few playlist he had everyone up on the dance floor. I would sure book him again for another big event. I also would love to keep a friendship with him hubble, funny guy. Dj Mastermind is the full package to you next event. He’s very professional and knows how to get the party started for you next event. My go to DJ!!! From the start of the ceremony to the end of the reception, Mastermind had our guests and us partying all night long! Awesome job done mixing portuguese and latin vibes with 90's hits. Mastermind took us back to the good times, it was an amazing time and glad we got to share our special day with him and our guest. His DJ name truly explains his talents becsuse once he starts his flow you are in the Mastermind Experience! Thanks again for a great time. Lee was great! He DJ'd our wedding in Tiverton, RI on 9/9/17 and all of our guests had a blast. Our venue had an unconventional setup that separated the dance floor from the dinner space and he was able to quickly adapt the sound equipment between the two spaces. He was a pleasure to work with - fun but professional. He took in all of our music suggestions and adapted the music the night of to make sure everyone stayed on the dance floor. He had an uplighting package available, which we didn't end up using, but it was nice to know that it was an option had we needed it. We would definitely recommend him to other couples! Had our wedding in Rehoboth, Ma on September 1st, Lee has been nothing but fantastic through our wedding process. Hes been helpful and professional. With a very diverse wedding he had our guests dancing all night! The guests were all happy with the music selection. I would definitely work with him in future events and you should too!!! My wife and I had our wedding in Newport, RI this past Sunday, and DJ Lee was a big part of the night's success. 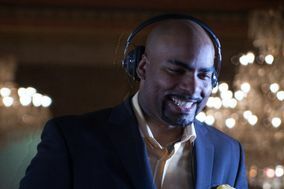 He really understood well our musical taste and adapted throughout the evening to our guests' vibe on the dance floor. We had to plan our wedding from distance, and Lee made it very simple for us with his quick answers, on point suggestions and availability. Merci mille fois Lee! Yes, you should absolutely book Lee. There, pretty simple. We recently got married in South Kingston RI, and while planning the wedding on short notice we totally lucked out in finding him. We had an outdoor ceremony, separate outdoor cocktail hour and an indoor reception. Lee totally had us covered everywhere. He kept everyone up and dancing all night, and ran things so smoothly that we really couldn't have asked for anything more. Loved our experience with Lee. He is very professional with his work and knows how to keep the party live. We asked for a mixed cultural of music and he did just that. He literally had our dance floor platform shaking (if that itself doesn't explain enough ??) He knows what he is doing and this is definitely his element of work. If we had another event we would surely hire him in a heartbeat and would highly recommend him!!!!!! I just got married on July 3rd at the Omni Providence. Mastermind was everything we were looking for-variety of music, great personality, prepared and professional. He also went above and beyond to find out what organization I could use to donate my flowers for cancer patients. Mastermind also made sure to coordinate with my other vendors so that everything went smoothly for us. He wanted to be more than just the DJ, as we were hanging a 310 per wedding. Everything went smooth! Thank you! DJ Lee Mastermind is an awesome DJ! From the very first phone call he was upbeat, professional, and fun! He took note of what we wanted and our personal style, and he definitely delivered. There were some significant hiccups the week before and day of the wedding, and he remained calm and rolled with all the punches. During the reception he got the crowd up and dancing- they loved him! I would definitely recommend him for your event! The service you provided for our wedding was over the top.. You are such an amazing DJ we couldn't of asked for anyone better than you. You got the party started right and your professionalism was amazing.. Thank you for making our day come true and for such an amazing time.. My guest were so happy with the music and how the night went.. You will be my DJ for other events.. Thanks again..
Lee. He was actually one of the very few things in my wedding that I wasn't nervous about. Believe me, you will not regret working with him!! great music... great announcer... he played all our requests and kept our families on the dance floor all night. not once did anyone complain about volume or value of music selection (no offensive selections) and my bride was very happy to have selected him as our wedding DJ. DJ Mastermind took out time and met with us on a personal level to make sure he has the right selection of music that you want played. He did a amazing job keeping the guests excited and and pumped up to dance. I recommend anyone needing a dj to get him Asap!!!! Dj Mastermind was great! From the very beginning we had great communication. He gave us great tips and song choice suggestions. Dj Mastermind had us dancing all night. Our reception was a great success. We expressed our vision for the day and he made it happen! We couldn't be happier with his services! DJ Mastermind was amazing!! We hired hi only a month before our wedding and we was prompt in responding to all our questions and concerns! The music was great and had everyone on the dance floor! Guests are still telling us what a great party it was!! Thanks DJ Mastermind!! Cool guy who is very passionate about music. Captures your tastes for music based on a small list of songs. Very accommodating about jumping on calls before the wedding, making last minute announcements during the wedding, and putting in the songs you specifically request. Our wedding was a blast with DJ Lee! DJ Lee kept people dancing all night. He played songs from many genres of music to accommodate our different backgrounds and tastes. We provided him a list of songs at our introductory meeting to give him an idea of our taste and the feel we wanted for our reception. Overall we were very happy with the services he provided, and would definitely recommend him to friends and family.